Work from Anywhere is a column here on the blog where we choose a far flung location and talk about what you’d need to run a successful business there. The awesome thing about running your business on the cloud is that you truly can work from anywhere, including at the beach, from the Egyptian pyramids, and from the North Pole. However, this week I’m talking about something a little close and personal. I’m Steff, and I’m a full-time marketing copywriter and blogger here at WorkflowMax. What many of you won’t know is that I only visit the airy Xero offices twice a week. The rest of the time, I’m working from my off-grid eco-home on the South Kaipara peninsula, about an hour’s drive north of Auckland city. My husband and I have been living off-the-grid for about 14 months now. We designed our house ourselves and helped to construct it alongside my awesome Dad, who’s a builder. We love the lifestyle and can’t see life being any other way. I am very blessed to live in a beautiful country like New Zealand and to work for an awesome company like Xero who allow me to follow my dream. So What Exactly is Living Off-the-Grid, Anyway? That’s a very good question. Living off-the-grid means different things to different people, but usually it refers to living off of the main power grid. Some off-grid households may take things a step further by living outside of all national and local networks (water, sewage, internet, cable TV, phone, etc), and those even more extreme try to live without any form of identification - effectively becoming invisible to governments. People living off-the-grid need to find ways to generate their own power and manage their own utilities, whether this is solar, wind, hydro, or other technologies, or simply doing without. 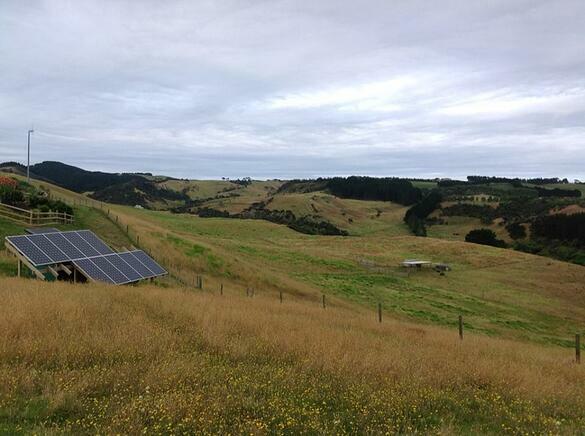 For us, off-the-grid means living in a small house built using eco-principles (passive heating and cooling, etc) on four-acres of farmland in a rural area near Auckland city. We use solar panels for power, a worm farm for recycling our sewage and greywater, and rainwater collection for drinking water. We currently have a small flock of sheep for meat, some chicken scratching around, supplying us with an abundance of eggs, gardens to supply fruit and vegetables, and two cats doing their duty as rodent control. The only concession we made to the grid was to connect to the internet via broadband cable. This was mainly because the majority of my work is done online, and the other option - satellite internet - wasn’t going to provide the speed and quality I’d need. I wrote a pretty comprehensive blog post on my personal blog about where to start if you’re thinking of living off-the-grid. It explains why we decided to live off the grid and how we designed our solar system for our lifestyle. What is it Like Living Off-the-Grid? 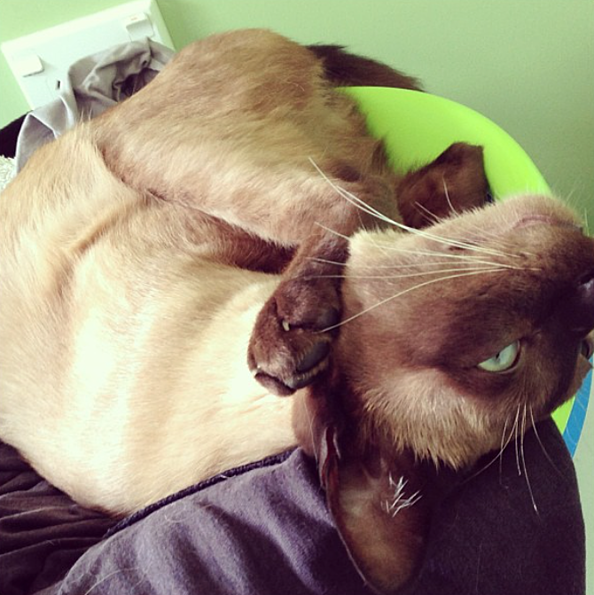 Socrates, practising his cat yoga. Remarkably similar to living on the grid, actually. Contrary to popular belief, not all people living off-grid are mung-bean eating, sandal-wearing hippies. (And, of course, if they are - that’s no bad thing at all!) We’re a pretty normal, middle-class couple, with all the accompanying gadgets and gizmos. We feel we’ve had to sacrifice very little in order to live this lifestyle. It’s much cheaper to downsize your lifestyle than it is to add more solar panels and batteries to your system to cope with more power, so when you design an off-grid system you think about any way you can to reduce your power needs. We cook and heat water using gas, and we can’t run any power-guzzling appliances like air-conditioning, electric heating, or huge gaming PCs. All our lights are LEDs. We turn off every appliance at the wall when not in use. We find too, that with four-acres of land to look after, we have less time for things like surfing the internet and watching movies. 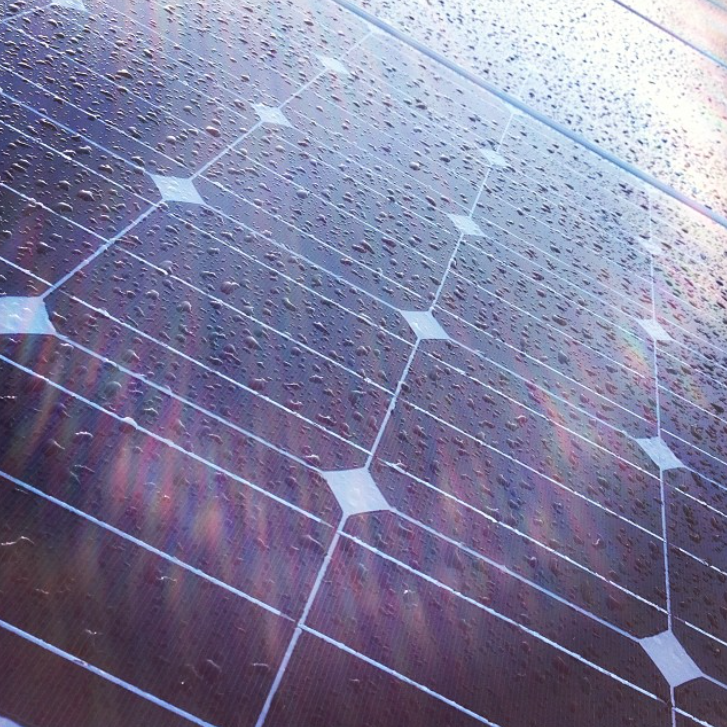 We have 10 solar panels, and a battery bank to store the power we generate. This will power our house for three days without any sun - any longer and we’d need to run the generator to charge the batteries again. On this system we run a fridge, a chest freezer, all our lights, two iMacs, our TV and DVD player, a fan, whatever power tools we need, and all my husband’s music recording and speaker equipment. We don’t feel as though we’re missing anything in life at all, and not having a power bill every month is pretty awesome! An additional advantage is that the area where we live is prone to bad storms that cut out the power. In 2014 the neighbourhood had eight extended power cuts, one of which was for three days. We do feel awfully smug looking out over a darkened valley during a power cut with all our lights on! 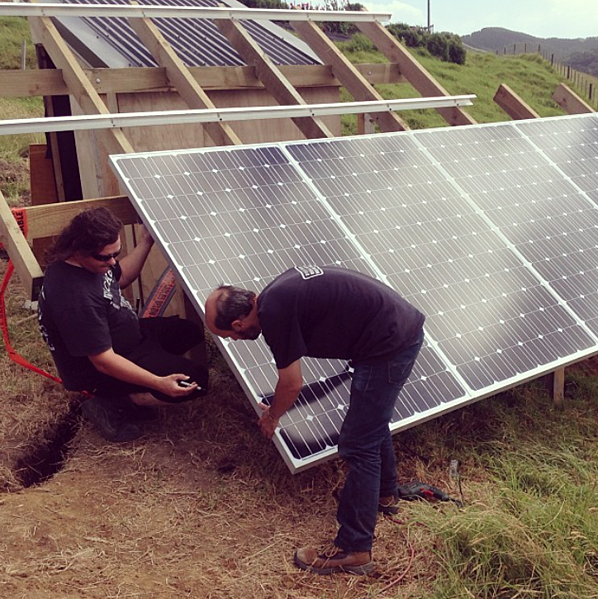 Installing the solar panels with our neighbour, Carlos. Before I worked at WorkflowMax, I worked at a national non-profit, transcribing braille and electronic texts for blind and low-vision readers. I am actually legally-blind myself, and as such, I can’t drive, or fly an aeroplane, or do a few other annoyingly useful things, like see when a chicken is properly cooked. So what is it like living off-the-grid and working from home? Well, here’s an example of my typical day. I wake up around 5:30am. Actually, that’s a lie. My cat Socrates jumps on my back at around 5:28am, a couple of minutes before the alarm goes off, because it is time for his breakfast. If I don’t get up, he tramples all over us and howls until someone pays him attention. I get up, feed Socrates, get dressed, and go out to feed the rest of the animals, water the gardens and collect the eggs. 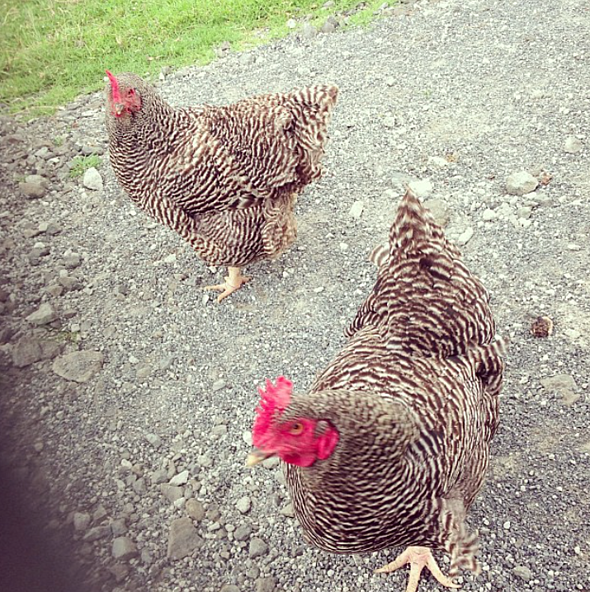 Sometimes the naughty chickens will lay in the gardens instead of in their coop, and I have to go on a bit of a hunt! When I come back inside, my husband is ready to go to work. I give him a kiss (awwww) and get his lunch from the fridge. I then hunt out some breakfast, fill up my water bottle, go upstairs to my attic office and turn on my computer. I check my emails and do an hour or two of work on my personal projects before I start work sometime between 7-8am. Socrates goes outside to hunt, and will usually come back inside around 10am with a bird or a mouse or a rabbit, which he will dump proudly on my keyboard. I scream loudly and quickly dispose of his “present”. While I’m downstairs, I get myself a snack and might put on a load of laundry. Between 8am-10am the rest of my team will come online. We all have Skype open during the day, and use the messaging feature to stay in touch about projects. As a cloud company, we believe in practicing what we preach, so we run our entire team through cloud-based software. I write blog posts and create lists with spreadsheets in Google Drive. We use Trello to track the projects our team is working on, and Hubspot to schedule all our social media and blog posts. For WorkflowMax I write between 1000-3000 words a day, depending on the projects I’m working on at that time. At lunchtime I will head back downstairs and make myself something tasty. I will usually eat outside if the weather is nice. I usually take some time to go for a run, do some free weights, or do a quick farm chore such as cleaning the chicken coop, transplanting seedlings, or spraying some weeds. I might also put something on for dinner, such as a stew or roast. Then it’s back into work. I pound away on the keyboard while the cats sleep under my desk. I knock off around 5pm, when my husband comes home. In the evening we do more farm chores (currently we’re building raised garden beds), watch movies (we have a TV, but no aerial), or work on our various hobbies (he’s a musician, and has a soundproof studio in our home). It all sounds very idyllic, doesn’t it? Well, I’m not going to lie - it’s just as good as it sounds. Sure, I still have the occasional unproductive day, and once the internet got knocked out for two days and I had to work off-line, which was annoying. But basically, it’s awesome. Working from home only suits certain personality types. You have to be pretty determined and task-oriented to turn on your computer in the morning and get stuck in when there are cats to be played with, chores to be done, youtube videos to watch, and friends to catch up with over coffee. While I admit that, along with my other work-from-home friends, I’m a chronic Facebook status-updater, I’ve always been pretty good at being able to crack on with what needs doing. Plus, I know I am insanely lucky to have this kind of work arrangement, and I don’t want to mess it up by dithering around. In my next blog post, I’m going to talk about setting up a home office. Despite all the hard work it’s taken to get to where we are, working and living off-the-grid is pretty awesome. I am very blessed to have the support of a great company who understand the true meaning of work/life balance. Do you want to know anything else about living and working off-the-grid? Ask away in the comments! All images courtesy of steffmetal.